Our voca­tio­nal trai­nees, par­ti­ci­pants in a dra­ma work­shop, had three days – from Tues­day to Thurs­day – to work on a play. As they had to pre­mie­re their pro­duc­tion on the Fri­day, the clock was ticking. Their venue was the new lec­tu­re thea­t­re in Groß Hese­pe. Stam­ping their feet, clad in yel­low rub­ber boots, and forming a cara­van, our voca­tio­nal trai­nees enter the sta­ge. They make a cir­cle, each indi­vi­du­al eit­her side­ways on to, or with their backs to, the audi­ence. This con­veys that the cast are a clo­se-knit group. They move rhyth­mi­cal­ly to a record­ing of the Nan­cy Sina­tra song ‘The­se boots are made for wal­kin’’, until the music abrupt­ly stops and the trai­nees, cur­sing, go their own sepa­ra­te ways. The rub­ber boots are some­thing of a recur­ring the­me in this pro­duc­tion, func­tio­n­ing as ‘tele­por­ta­ti­on shoes’ for gol­fers, the ‘Vaso­mat’ sen­sor for house plants and the ‘Mul­ti­tool’ device at a fes­ti­val. Our trai­nees demons­tra­te how ver­sa­ti­le a pair of yel­low wel­lies can be and their adver­ti­se­ments are smart, humo­rous and iro­nic, as evi­den­ced by the fact that the Mul­ti­tool can be used for coo­ling drinks, hea­ting up food or ‑ who’d have thought it? ‑ kee­ping one’s feet dry in the rain (unli­ke flip­flops)! ‘Mul­ti­tool ‑ means your beer is always cool’, ‘Mul­ti­tool ‑ means your feet need never be cool’ and ‘Mul­ti­tool ‑ means you’re always cool’ ‑ with slo­gans and self-satis­fied smi­les, the trai­nees extol the vir­tu­es of this mira­cle foot­we­ar. With a com­mer­ci­al par­o­dy­ing the ste­reo­ty­pes of adver­ti­sing aimed at the house­wi­fe mar­ket, our trai­nees get the audi­ence enthu­si­astic about the ‘Vaso­mat 300 +’. Lore­na Ahrens plays the des­pai­ring Haus­frau, con­vin­cin­gly moro­se and shame-faced as she admits her house plants have died on her again. Natu­ral­ly, howe­ver, her sty­lish fri­end (Sabri­na Wal­ker) knows what to do: “I’ve got just what you need – the Vaso­mat!” The pithy but catchy slo­gan “Red means it’s bare­ly ali­ve, green means it’s going to thri­ve” is repeated with hoots of laugh­ter by many mem­bers of the audi­ence after the play. And acting, of cour­se, means step­ping into someo­ne else’s shoes, which they all do con­vin­cin­gly. It is obvious that the end of the play will be met with thun­de­rous applau­se for our trai­nees, as the audi­ence have enjoy­ed them­sel­ves tre­men­dous­ly. 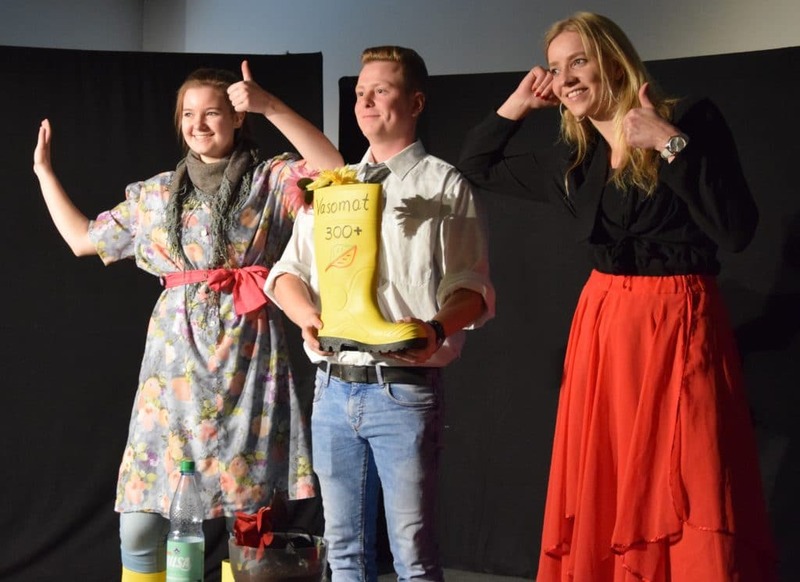 The talen­ted young cast not only impress the thea­t­re­go­ers by vir­tue of having put on a play after only three days ‑ qui­te a feat ‑ but with their expres­si­ve use of their bodies, voices and music, their humour and their knack for par­o­dy. 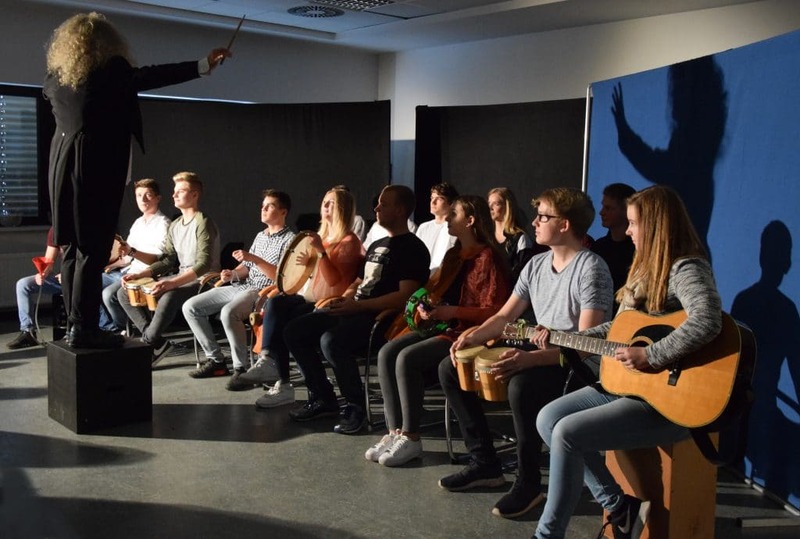 In an inter­view with our edi­to­ri­al staff, the par­ti­ci­pants revea­led that the four days of the work­shop and per­for­mance had been a real chal­len­ge. 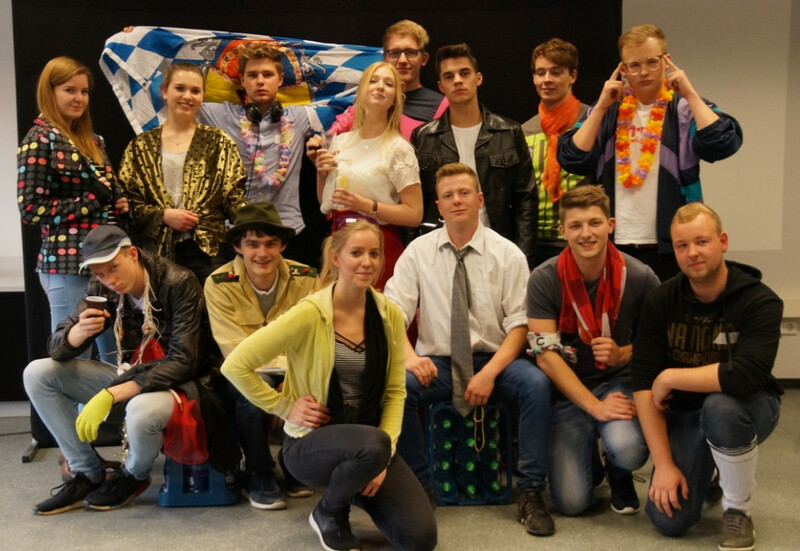 “It was fan­tastic fun, but we were exhausted every evening,” says Busi­ness Infor­ma­tics stu­dent Jakob Schoofs. “I think the rea­son was that we had an incredi­ble amount to pro­cess.” It was the dra­ma exer­ci­ses that he found most sti­mu­la­ting: impro­vi­sa­ti­on, con­cen­tra­ti­on and being awa­re of one’s fel­low actors. Has eye con­tact been estab­lished? What is the other person’s pos­tu­re tel­ling me? The­se things are use­ful in ever­y­day life as well.